When I was 8 years old I walked off a boat and walked onto a camp that would later transform me. When I was a child, school was never my strong suit. I always hated school and my grades reflected that. However when I went to this camp, it was different. Camp didn't involve the academic parts of school. I feel in love with camp because it was something I was good which was foreign to me at the time. When I was a camper I was a grade top notch. I ran the fastest, sang the loudest and laughed the loudest. I vividly remember hitting a bulleseye eye on my first try and catching three fish which was uncommon. It was moments like these that made it so I could go back to school in the Fall do do okay. Camp has a huge piece of my heart and I credit camp for making me the woman I am today. When summer camps aren't inclusive it's practice of ableism. 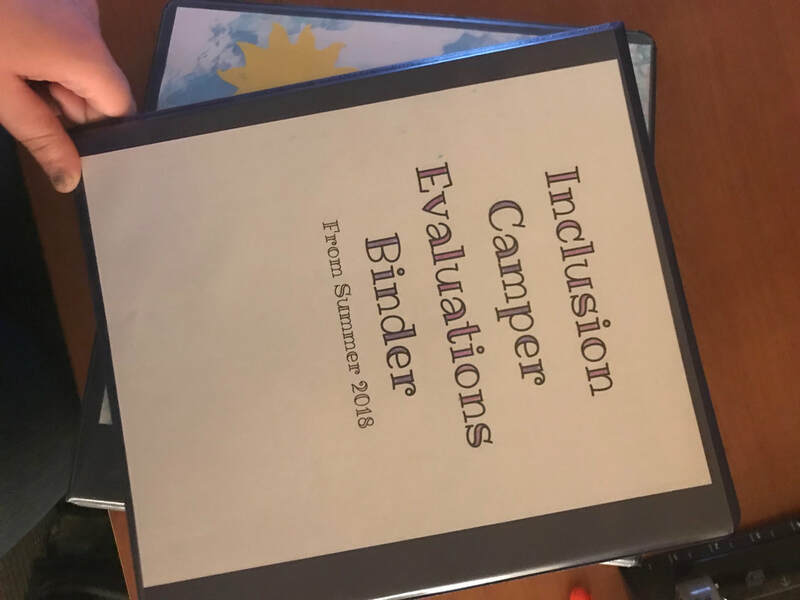 It's not uncommon for campers to get sent home due to their behavior as a result of their disability or to be denied acceptance to camp because of a disability. It's justified when camps use language like "we can't accommodate" or "maybe in the future." It's acceptable because there are separate camps for kids with disabilities exclusively. However, all camps should be striving towards a future where they can accommodate campers with disabilities. It can't happen overnight but all camps can make small changes. One is hiring a couple extra staff to be extra hands for kids with behavioral issues. Another might be when introducing new activities to your camp only use those that can be modified for people with disabilities. It's 2018 and it's time to end turning campers away because of a disability. On the note of having campers like Easter Seals that are for children with disabilities that need a 1:1 staff those programs are excellent and need to continue. There will always be a need for camps the operate for kids exclusively with disabilities. However, that's not the perfect fit for all kids. What I see currently is that families are stuck in a place where their camper is not able to function in classic camp but also doesn't need a 1:1 aid. Thus the need for inclusive summer camps is incredibly important. I worked with my community partner to help take their already inclusive camp to the next level. I have a bit of a background in Special Education and brought that to this experience. I also brought my understanding of disability activism and it's nuances to this volunteer experience. As well as and most importantly my own knowledgeable of camp. I’ve been working about 3 hours a week and my work changes a bit week to week. I've been able to volunteer from home with some skype calls and phone calls with my site supervisor. 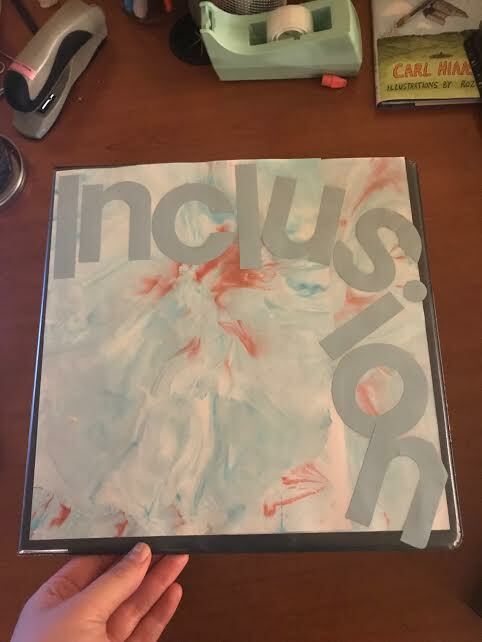 My overarching project was document of inclusion practices thats called “Inclusion Manual of Camp ___.” Within that manual I have created inclusion plans that have been approved by the Camp Directors and they will start implementing. This is a very comprehensions document that pretty much covers all bases for inclusion practices with the most up to do date information. The last time anything had been updated for this department was 2007 and much of it was inappropriate for what we know about special education practices in 2018. 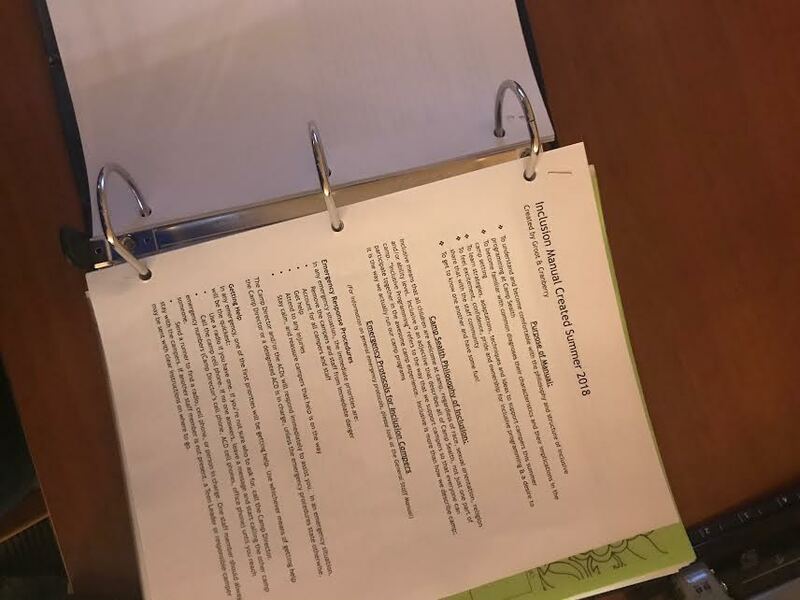 I really enjoyed writting the emergency management protocols because I think that's one of my strengths and have some experience this year responding to crisis. I have created other various documents in that same vein of educational tools for staff training. I have enjoyed being able to connect with parents of kids with special needs and that's where I feel I am most useful because I have more time to be able to talk in depth. They gave me access to an inclusion email so I can just talk to families on their. I have also helped them reform their active shooter drill to keep in tune with the political climate, which was outside of my original goals but I enjoyed doing it. Thinking about social change in general I think having multiple perspective is key and that's a lot of what i’m doing. The main thing I am volunteering is my time and my expertise. Before I started this work I projected my ideas about this capstone class onto my site supervisor and he seemed to like where I was going with it. My biggest overarching goal was to use updated information but that goal breaks down into a lot more. 1) In order to use the most updated information I used critical thinking more than anything. I understand that disability is complex and there is not one size fits all. I had to think critically about the many layers and angels and find a way to put that all into my writting. 2) I worked hard to effectively communicate with my site supervisor while I was remote. Communication over Skype and on the phone is different than in person. I have some very strong opinions and I wanted to be aware of how I came across of expressing those to the higher ups. If I wanted to reach my goal I also had to consider the goal of effective communication first. Even though this was my project I was still working in a team. 3) I am proud to say I strived to bring this goal to life. I worked to show that people with disabilities are a group that should be included in social justice movements. In my writting I always use empowering language. I also show that accommodations are an example of equity and not special treatment. 4) Finally I see socially responsibility as a big part of what I'm doing. Previously it wasn't socially responsible to have such outdated teaching tools for this population especially when this information is so readily available. I see what I was striving for as a step in the direction of social responsibility. Moving forward I hope that I lot of the work I have created for this camp continues to be utilized. Even though I am finishing up my time with this organization, it's a place that's very special to me so I will stay in touch. I can picture myself helping out with inclusion things for years to come especially as I advance in this field. This capstone gave the tools to get the ball rolling to get that rolling. I plan on checking in to see how the work I have created for them is "doing" in a couple years as that is really important professional feedback for me. It's a lot easier to edit what I have rather than what they had from 2007 hopefully as time progresses I have set them up for success. Overall the work I have completed is quality. I spend a lot of time researching and considering language before I put anything down in print. There is a lot of information and perspectives about disabilities that I work hard to consider. I work really hard to make sure what I am writing is written in away that everyone can understand and is a strong educational tool. I also make multiple edits before I turn something into the my site supervisor. I think change was impacted in a lot ways with the work I have done but if anything just opening the door for more conversations about inclusivity this summer. I think camp has made some really amazing changes overall and especially since I was a camper. For me personally something i’m curious to explore myself is about the connection to disability and other “ism” but especially race. I would be curious if Camp could do anything to shine light on how bias comes into our practices with children. I know that staff sometimes don’t want to have a kid with a disability in their cabin because it’s more work and I wonder it would look like to explore if that was also a child of color. There is so many nuances in the world of disability and i would love to see Camp up to pair with that. When I think about change on a large scale I think it’s important to understand disability as a bigger picture outside of camp as well. In the future if I was doing something like this I would have included the ACA. The American Camp Association has requirements for summers camp to maintain accreditation. From what I can tell the ACA has no requirements on disability things for camp. They do have articles on the importance of inclusion at camp which tells me they are on the brink of it. In terms of creating social change for inclusive summers camp connecting with the ACA would be the route to go. It’s important the ACA sets standards for all camps for comply to for having kids with special needs. Another small thing is the history of the program I am support is a little patchy. I know some vague details about it. I left that part of this page on purpose because I have so little to go off of. That would have been a good thing to get a better understanding of before I started my work. It's hard to work on changing the future when I don't know the past. 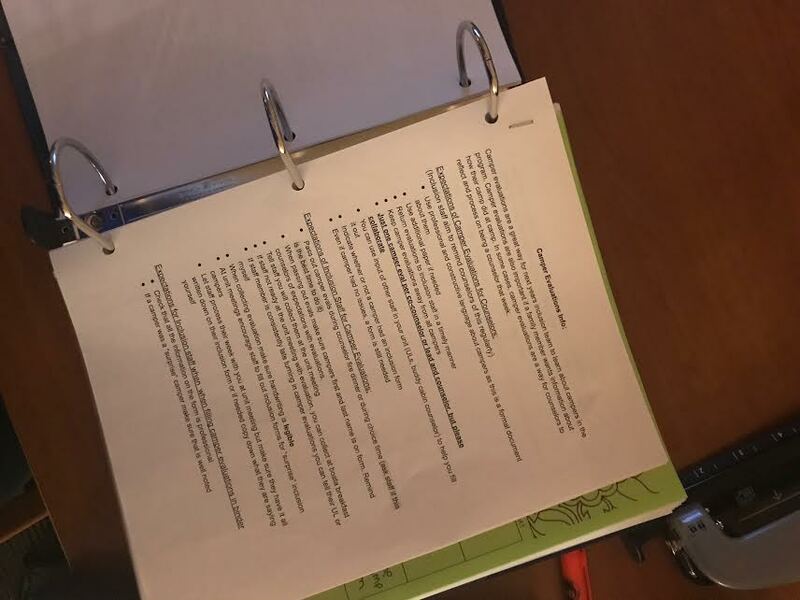 I created two binders in the end of my work and I deceived to to one crafty using marble paper.